The Talbot Pushfit range of fittings from Tyco Waterworks is used on Polythene service pipe, combining ease of use with durability in service. Available in metric and imperial sizes from 16mm to 63mm for various classes of pipe, these high performance fittings can be installed without tools and will withstand pressures up to 16bar. 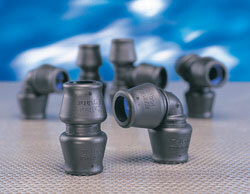 Pushfit fittings are available in a wide range of configurations including the usual connectors, bends, tees and threaded adaptors and also many combinations of unequal ends so that virtually any conceivable connection can be catered for. The fittings are constructed from tough corrosion resistant thermoplastic with low theft value and have no loose parts to get lost or misassembled. A selection of Pushfit joints adapted to fit common sizes of lead pipe is also offered, bringing the same ease of use and durability to connections between old lead pipes and new plastic replacements. Contact us to discuss your requirements on 01 450 8046.